This period calculator is a must-have tool for every woman who wants to understand her menstrual cycle. You can use this period predictor to determine when is your next period, for example, to plan a period-free vacation. You can also use it as a period tracker that gives you accurate information about when is the best time to get pregnant. If you're expecting, check whether the pregnancy is developing properly with our hCG levels calculator. Your cycle duration. The cycle typically lasts for about 28 days, so if you're unsure about how long yours is, 28 days is a reasonable estimate. If, however, you have been using a period tracker for quite some time, you might now that your cycle is consistently longer or shorter - for example, 27 or 30 days. Period duration. Some lucky women only experience bleeding for about three days, while others have periods lasting about six or seven days. Enter the average duration of your period in this field. Last period started on... The last information our period predictor needs is the date when your previous period began. This day is customarily understood as the first day of your menstrual cycle. 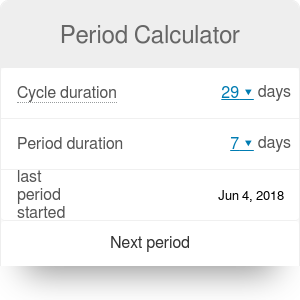 Once you input all of that data into our menstrual cycle calculator, it will automatically estimate the dates when your next period starts and ends. For example, if your last cycle started on November 16th, and it typically lasts for 29 days, you can expect the next period to begin on December 15th. For a five-day-long period, you can expect the bleeding to stop on December 19th. Naturally, menstruation defies exact calculations, so it might happen that your period will be a few days early or late. Still, it's a pretty good estimate to know whether you will get your period in the middle of your vacation. You can also use this period calculator to find out what is your fertility window - that is, the time when you're most likely to get pregnant. As sperm can live up to seven days inside your body, you can safely assume that the fertility window starts seven days before ovulation. It ends only one day after the ovulation, though, as the egg lives for maximum 24 hours. Ovulation is the time when an egg is released from your ovaries. This is the time when you are most fertile. It usually happens about two weeks before the start of the next period. If you want to have a more precise estimate, you should monitor your body temperature and the changes in cervical mucus. Period Calculator can be embedded on your website to enrich the content you wrote and make it easier for your visitors to understand your message.